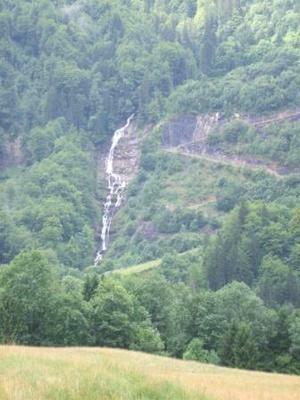 These two falls lie across the valley from the village of Salvagny. They are separated by only a few hundred feet. 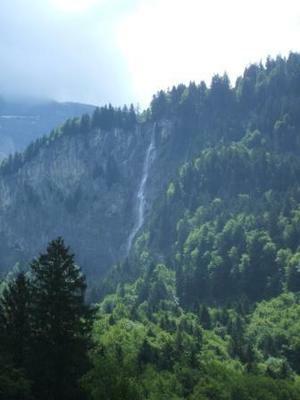 The Cascade de Déchargeux tumbles down over the bare rocks and is very visible from the road. 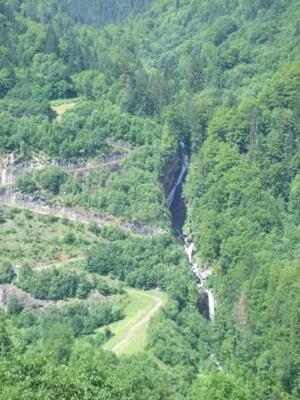 The Cascade de Saubaudy has cut itself a deep gorge and its first fall drops at a curious angle, combined with the surrounding trees this makes it more difficult to spot. Both cascades join the river Giffre des Fonts. It is possible to hike to the falls from the village. Another fall we spotted not many miles away near the hamlet of Brairet was the Cascade du Dard. This one plunges from the top of the cliff in an impressive free fall and is popular with ice climbers in the winter.